Unless you’ve been stranded on a deserted island for the past couple of years, you’ll have noticed that avocados are everywhere! This little green fruit has been added to meals in almost every restaurant and home recipe possible. The ‘avocado trend’ is no bad thing for your body, as the fruit contains potassium, vitamin B5, vitamin B6, vitamin C, vitamin K, vitamin E. As well as possessing heart-healthy fats and a high fiber content. The one downside of the trend is that over the past year the average price of avocados has gone up by over 25% as grocery stores look to maximize their profits. To save yourself some money and be able to eat fresh, organic avocados growing your own avocado tree is a must. The word tree may insinuate that you need an enormous amount of space. However, an avocado is a small and easy to grow tree. Carefully clean the avocado seed and ensure you know which end is top and which is the bottom. Stick four toothpicks into the seed at equal distances apart about halfway down. From there get a glass of water and set your seed in it, the toothpicks should keep it soaking in an inch of water. The seed should be placed out of direct sunlight but in a warm place until the stem has grown to six inches and the roots are visible. This growth should take between two to six weeks, at which point the stem should be cut back to three inches. Wait for more leaves to grow and for the stem to reach six inches again before planting. Get yourself a large plant pot approximately ten inches in diameter, with a small hole in the bottom for drainage. Fill the pot with nutrient rich soil, leaving a small hole in the top of the compost for your seed to go in. Place the seed in the hole ensuring that it isn’t too deep and that half of the seed is exposed above the soil. 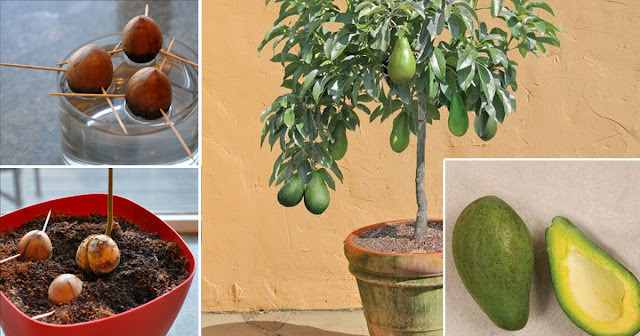 Once the avocado tree is planted, move it into a sunny area of your home. Water the tree generously and regularly, ensuring that the water remains moist but not saturated. If the leaves begin to turn brown and dry, it is a clear sign that the plant isn’t getting enough water. To solve the issue put the pot in your sink, turn the tap on and allow the water to run through the soil for a few moments, ensuring that you drain any excess water before taking the plant out of the sink. If the leaves begin to turn yellow and droop, you are over watering the plant. To rectify the situation, don’t water the plant for a few days and lower the amount of water you give it in future. Keep up regular and caring maintenance of your tree in order for it to flourish. You may well have to wait a couple of years before it first begins to bear fruit but when it does you’ll be enjoying your very own fresh and delicious avocados. This post was republished from theheartysoul.com. You can find the original post here.